The American Goldfinch's summer plumage is a striking lemon yellow in the male. The winter color is more like the female's summer attire except a bit more grayish in color. They are fond of thistle seed and weed seed. Even the dandelions on your lawn provide food for them, so don't get rid of all the weeds if you like having these colorful birds around. If you just can't abide weeds, then put out a feeder with thistle seed in it. 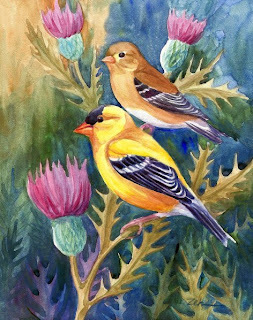 This past summer, I used a regular song bird mix and the goldfinches visited daily.